To view upcoming outreach events click What’s Happening in the Preserve? or visit the Event Calendar. Habitat Authority Educational Programs include Hills Alive, Junior Ranger and Girl Scout Badge. For a description of all Habitat Authority Programs, click here. Hills Alive is committed to creating an awareness of and appreciation for Puente Hills’ natural habitat and wildlife by offering informative and entertaining education opportunities. Our hope is to instill in each person we meet a sense of place, stewardship and a greater understanding of the need for preservation for future generations. Hills Alive provides group programs for schools and the general public. The Habitat Authority believes that learning must be fun and engaging. Therefore, our programs are all activity-based and interactive. In addition, all of our school programs are aligned with California Common Core Standards and the Next Generation Science Standards as well as other academic areas. Our multi-sensory teaching techniques lead children to learn about habitats, plant and animal life cycles, food chains, Native Americans and more. Our trained docents and skilled staff will implement the program, and the children will be under the supervision of the teachers and/or groups’ chaperones. Why Choose Hills Alive Programs for your Class? Hills Alive provides opportunities for students to have direct experiences with the living environment by bringing nature education and hands-on science education outdoors! Students will explore scientific concepts and natural history in our outdoor classroom that brings their science lessons to life. Moreover, nature is essential to a child’s overall development—research has shown that children are smarter, more cooperative, happier and healthier when they have frequent and varied opportunities in the outdoors. Our programs are designed with this in mind, blending positive interactive inquiry-based nature activities with school curricula and California learning standards. How do Hills Alive programs fit with the California State Learning Standards? 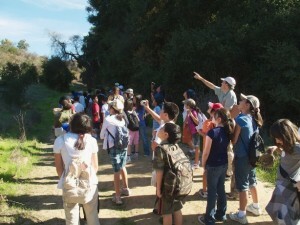 Hills Alive has developed its nature education programs to correlate with Next Generation Science Standards, adopted by California in September 2013, to compliment teachers’ in-class lessons. 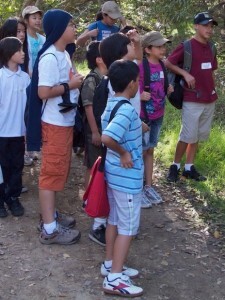 Field trips for schools can only be arranged by/through a teacher for an entire class or grade. Reservations are taken on a first-come, first-served basis. Reservations for the upcoming school year open on the first of August. Please sign-up by clicking here. If you would like to talk about the possibilities, contact Hills Alive, by phone at 562-945-9003 or via e-mail at HillsAlive@HabitatAuthority.org. Transportation fees are available but limited. These Hills Alive programs are partially funded by Hills for Everyone, Kohl’s, and other donors. The Habitat Authority is available by appointment to provide ranger-led hikes and general presentations about its activities. Another type of educational program is a Junior Ranger Program, offered to children in surrounding communities. It consists of two separate two-hour sessions in-class focusing on topics related to conservation, nature education, park stewardship and wilderness skills development, followed by a hike in the hills on the third visit. If you would like a Jr. Ranger Program for your group or children’s classroom, contact Ranger Francine Godoy at 310-858-7272, extension 150. Newly designed after-school programs for troop members grades K-5 that help educate local children about nature while completing troop-level badge requirements. Programs are 2 hours in length and consist of both a themed interactive activity-based hike in the Preserve and a take-home craft. Patches must be obtained by troop leader at local council location.